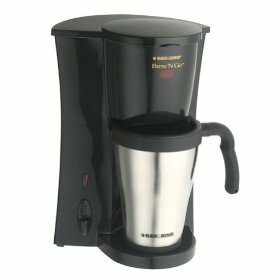 Perfect for one coffee drinker households, the Black and Decker DCM18S Personal Coffee Maker is a nice little machine with a great value. It comes with a 15oz travel mug. It automatically shuts off after brewing. It has a permanent filter. Finally, the travel mug, filter, filter basket are dishwasher safe. This coffee machine was made with the person-on-the-go in mind. And at only around $20, this is probably the best start for those who want to start filling their travel mugs at home instead of at the coffee shop.